Symptoms: Blows fuse on power up. When powering up the machine, the F114 fuse (8 amp) would blow. This fuse powers the lamp matrix as well as the CPU +12 volt circuit through a downstream fuse (F115), which is used for the switch matrix. So when I first power up the machine, the CPU was booting but none of the lights were flashing and the switches on the coin door were unresponsive. I disconnected all of the lamp matrix connectors from the Power Driver Board (J133 through J138) and powered up the machine, and the fuse blew again. Since all of the connectors were disconnected and fuse F115 wasn’t blowing, the problem had to be in the power supply itself. There are only two possibilities, a shorted bridge rectifier or a shorted capacitor (rare). I check the bridge rectifier and it was shorted between “AC” and “+”. I had a spare bridge rectifier on hand and replaced it. The machine powered up as normal this time. A lot of the matrix lamps weren’t working. I replaced a bulb near the flippers and it still didn’t work. I thought maybe a row or column driver had failed. So I ran the test for individual lamps and marked a copy of the matrix with an “X” if the lamp wasn’t working. No clear pattern emerged to indicate a row or column problem. So I started at the first bulb in the test and looked at each one. It turned out that most were burned out. Also, I found a broken wire for Row 1 of the matrix. Reconnecting that got about 6 more lights working, including the first bulb I had replaced where replacing it didn’t help. It’s a tedious process, but in the end the machine looked and played well. I probably replaced two-dozen bulbs. Symptoms: Pop bumper not working, display digit not working, needed cleaning and tuneup. The machine was good condition. I should have taken photos because the photos in the IPDB are of a machine in very poor condition. The non-working pop bumper was simply a broken wire going to the coil. I resoldered it. I checked the other pop bumper switches and noticed the top bumper’s switch was sticking. If you press down on a bumper skirt and it doesn’t immediately pop back, you’re asking for a burned-out coil. I cleaned the spoon that the bumper skirt rests on and that seemed to help a lot. Often the pointed end of the bumper skirt that contacts the spoon gets roughed up and needs to be sanded or filed smooth and round again. It’s a pain to do because it’s difficult to get to, and often involves removing it which requires taking the whole assembly apart. The display on Player 3, least significant digit, was dead. I checked the card edge connector and made sure the card edge was clean. I fired-up the oscilloscope and saw that the pulses (4 volt) were going into the digit driver IC, but no 60V pulses were coming out of the pin for that digit. The other digit drivers within the IC were working fine. The IC is a UDN6118A, which is no longer made. These can the purchased used on E-bay from Chinese distributors. There was also a new one available at a US chip broker, for $15, plus $8.99 shipping. Does it really cost $8.99 to ship something that weighs as much as a paper clip? No! For the same price, I can get 5-10 used chips from China. For the time being, I swapped the Player 3 and Player 4 displays because the owner said the Player 4 gets used less often. The owner is contemplating whether to repair the display or live with it. I was surprised to see that PinScore doesn’t make aftermarket displays for Gottlieb (and neither does anyone else that I could find). I also advised the owner that the rechargeable battery on the System 80A control board should be replaced before it leaks and ruins the circuit board. I replaced bulbs and did a quick cleaning of the playfield. When I played the game, I thought the sound board had something wrong with it. There was a lot of background noise. But it turns out the background noise is supposed to be crowd noise like at a stadium. I verified by watching a YouTube video of the same machine. You have to use your imagination. I think it would have been better to have some background music with an Olympic theme. The machine would immediate blow the fuse (less than 1 second) upon powering up. Fuse F4 supplies the 43 volt solenoid circuits which are prone to broken wires, shorted coils, etc. So, I expected to find a short somewhere on the playfield. I isolated the power supply by removing all of the connectors except for J2 (cabinet) which supplies the wall AC power to the power supply, but this connector also supplies solenoid power to the knocker and the coin door. The fuse still blew. I checked the cabinet wiring to make sure there was no short, then focused on the power supply itself. It turned out to be a shorted bridge rectifier between the AC and the minus (-). I brought the power supply back to my shop for repair. I looked up the part number for the bridge and found it on Marco’s site. For better or worse, the bridge I received was slightly larger. Not only were the pins further apart, it was also thicker. New bridge rectifier (black square) above an original working bridge rectifier just below it. This posed a problem as there are two bridge rectifiers in the circuit and both are mounted on the bottom side of the PCB and are heat-sinked against a metal bar on the power supply chassis. If one is thicker than the other, one will be heat-sinked, the other will not. I decided to shift the bar over, so that existing bridge would contact the bar and the new bridge would go directly to the chassis. 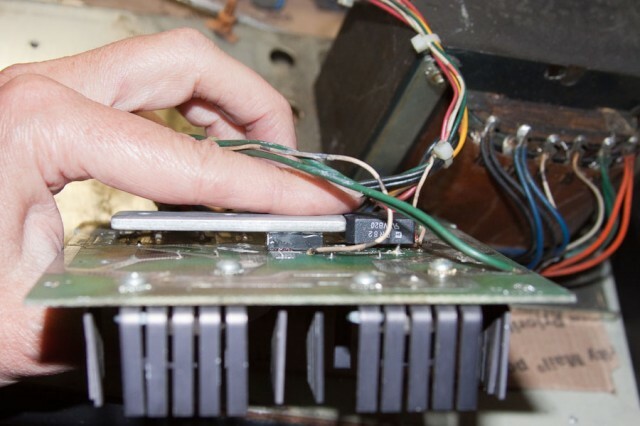 With the metal bar, both rectifiers will contact the chassis when the board is remounted. I added some new heatsink grease to both bridges. I powered the circuit and all was fine. 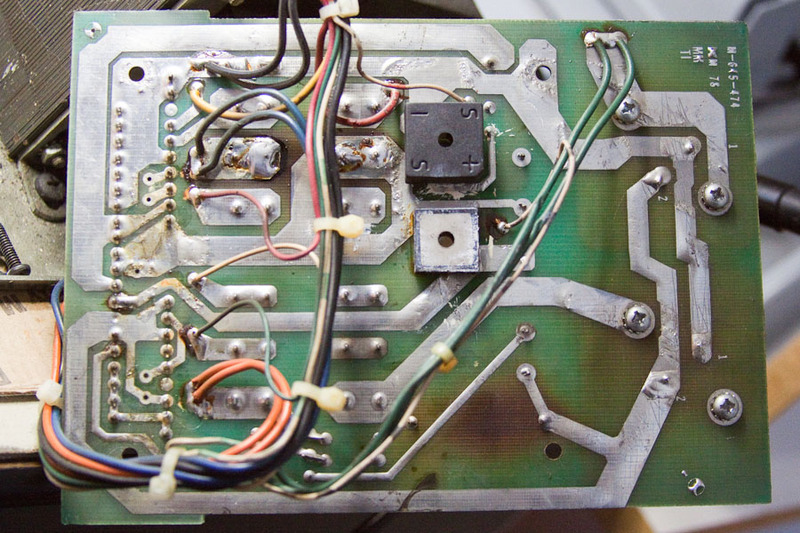 This power supply was only used on two machines, KISS and Space Invaders. Back at the customer’s location, the game powered up and worked fine. I replaced a few burned out bulbs. The NiCad RAM backup battery mounted on the CPU board has partially failed. I am debating whether to replace it with a 1 farad super cap, or the typical 3 cell AA holder. The super cap requires the machine to be powered up periodically so that it can recharge. The AA batteries don’t require recharging, but there is no nice place to put the battery pack and they have to replaced every few years. Symptoms: Many. Bulbs out, trap door not working, a pop bumper not working, both sling-shots not working, flipper sticking, etc. Needed general servicing. The biggest mystery with this machine was that every GI (General Illumination) bulb was burned out, except for 3. I suspect that at some point in the past, there was a GI short to a solenoid supply which blew most of the bulbs. As I was replacing some of the controlled lamps, I discovered some that were burning very brightly. This raised a red flag that one of the rows or columns in the lamp matrix was stuck on. The easy way to check this is to go into the test menu and run the single lamp test. If more than one light comes on at a time, then the row or column driver is shorted or bad. It turned out to be Column 8 and the TIP107 transistor. All of the Column 8 lamps would light when any of the other columns were on. After replacing the transistor, the controlled lamps all worked except one. The one lamp that didn’t work was the “Open Trapdoor W/Flashing” light. It was lighting when any other column or row was lit. In other words, the only time it acted normal was when any thing in its own column or row was lit. At first I thought it was a shorted diode. The diode tested OK with the meter. But the meter doesn’t test the diode at greater than 3 volts. So I snipped it and the light should have gone dark, but it didn’t. It turns out, someone had soldered the wires onto the socket incorrectly and bypassed the diode. Once I corrected the wiring, it worked fine. As for the sticking flipper, it was a bad link that was catching on the end of the solenoid. I replaced the links, plungers and rubbers on both lower flippers. The upper flipper looked good enough to leave alone. The other solenoid problems were all related to broken wires. The trap door wasn’t working because the end of the spring broke on the solenoid that latches it up. I found the spring in the bottom of the machine and made a new hook with my pliers, and reattached it. The game had an L4 version Game ROM (U6) installed. The most recent official version is L9, plus there is an L9.05H, which is a home version with some additional features. The difference between and L4 and L9H requires a move to a larger ROM (1 Mb to 2 Mb), plus one of the sound ROMs (U18) had to get upgraded to L3. The L9H ROM images I downloaded from ipdb.org didn’t really match the documentation. The U6 ROM image was a 4 Mb image, and U18 was a 2 Mb image. In this Funhouse machine, both of these parts were 1 Mb so I couldn’t erase and re-program. I was out of 2 Mb EPROMs. So I ordered some blank 2 Mb parts from Marco and received 4 Mb parts instead. Ugh! I looked at the schematic for the sound board and saw that it would support a 4 Mb ROM. So, I programmed both images into 4 Mb EPROMs. This works fine for U6, but for U18 it doesn’t work without loading the code into the upper half of the EPROM to make it look like a 2 Mb part. Although the sound board hardware supports the 4 Mb ROMs, the firmware in the other sound ROMs doesn’t. A note on CPU jumpers for larger ROMs: I think by default, the early WPC games had the W2 jumper installed. W2 supports the 28 pin ROM families and will still work with a 1 Mb 32-pin ROM because the associated pin on the 1 Mb ROM is not used. But anything larger (2 Mb or greater) will need the W2 jumper removed and the W1 jumper installed. The W1 jumper supports all of the 32-pin ROM families. So when using a 1 Mb ROM, the jumper can be in either position. The same is true for the sound board with regards to U18. Jumper W4 supports the 28-pin families and jumper W3 supports the 32-pin families, with the 1 Mb ROMs not caring which position the jumper is in. But keep in mind that at least for Funhouse, the sound system firmware doesn’t support anything larger than a 2 Mb ROM in U18. After correcting dozens of small problems, the pinball machine is looking and working great!